It's a beautiful day, ladies and gentlemen. Want to know why? Because today I am sharing with you photos from a recent birthing session I did with Sophia and Brandon and their perfect little bundle, Liam. He was born at 3:20 am on August 25, 2018 at Home in Plant City, And my goodness is he one gorgeous and content little guy. I just loved the way these two interacted during Sophia’s labor. He was so supportive of her. I was so honored to be with Sophia and Brandon on the day of their child's birth. There really aren't very many things that are as beautiful as bringing another life into the world. 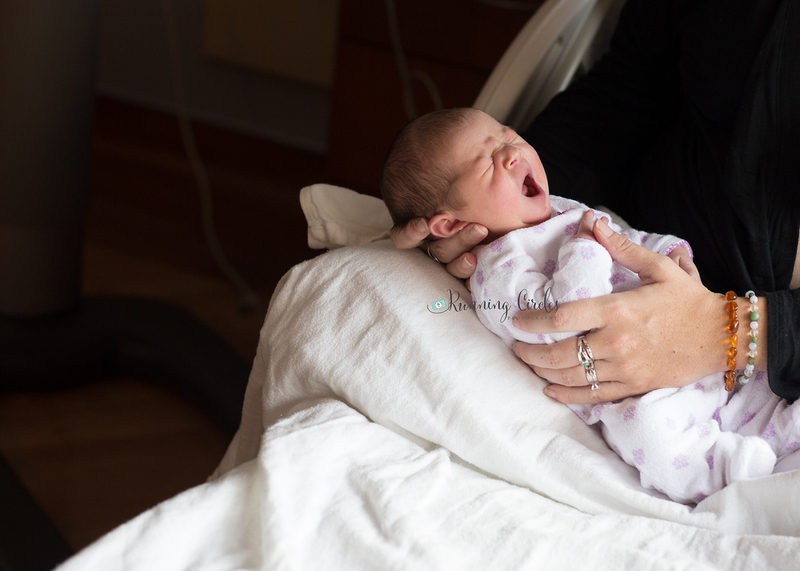 Sophia was absolutely amazing and totally rocked her home birth. This precious baby was born “En Caul” that means momma’s water didn’t break and he was born in his amniotic sac. It’s SO very cool to witness. The love in that room on August 25th was truly overwhelming. I know that baby Liam and his incredible parents have a lot more where that came from, too. I hope they keep me up to date with what's happening in their lives! Today I have a real treat for you and it comes in the form of a 3 day new (YES, I said 3 days new!) baby named Vivienne. Hold on to your socks – this little lady is so cute she may blow them right off! I am a total sucker for those brand new baby details! It feels like only a few days ago I was photographing her big sister Bella's photos. I can't believe it's already been 9 months from when her momma found out that she was expecting again! Time sure flies!! Because our last photo shoot went so well, I was over the moon excited when they called me up to schedule photos with their adorable little Vivienne! Anyway, I am beyond honored that they asked me to work with them again and to photograph little Vivienne. As you can see from the photographs below, she is an ultra sweetheart and was a joy to work with. See what I'm talking about below! Today I'm here to tell you all about Jack. This little nugget is only 11 days new here but the world's a better place since he arrived. Mom agrees, too, naturally! We all had a grand time hanging out and taking pictures together, even though Mr. Jack was afraid of missing out and was wide awake for most of our session. Even though he didn't sleep much, we got some seriously amazing photos! It certainly helps that baby Jack is such a photogenic little guy! Enough talk. Check out this sweetie for yourself! Let me stop for a second to tell you that I am seriously the luckiest photographer in the world. My clients are always so amazing to work with. That's true of my session with the Dowden family, too! This session was extra special as it was my first Military homecoming family session, I'm not kidding when I say I cried like a baby! Being a veteran myself as well as a military wife, I was absolutely honored when I was asked to capture this gorgeous session! Daddy was concerned that his youngest might not remember him since we was pretty tiny when he left, it was clear once sweet Brantley laid eyes on his daddy he knew exactly who he was. Big brother Denver also lit up once he spotted daddy in the crowd. These boys melted this momma's heart. As you can see from the comments above and the photos below, this family is not only photogenic, but also a close-knit group who clearly love spending time together. Tavia, Matt, Denver and Brantley are SO very lucky to have each other. Our session highlights are below! I do believe that fresh baby sessions are becoming one of my very favorite types of sessions to do. They're the best solution to a family wanting to capture their precious baby's first moments, but aren't quite sure about an actual birth session. This sweet baby's momma won my giveaway for a fresh baby session and I am SO thrilled that she did. This baby is perfect in every way. I could tell as soon as I walked into the room that she was very much loved. The room was filled with love and joy and momma and daddy were so very proud of their newest bundle! She joined her big sister and brother and I heard they were instantly smitten with their new baby sister. Look at her! What's not to adore?! Welcome to Florida sweet one, we're so happy you're here! I can totally see why her big sister and brother (mom and dad too!) are totally in love with her. This face is beyond precious! I absolutely love the simplicity of a newborn session. This sweet girl had changed so much from her fresh baby session, that it shows just how quickly babies change in such a short amount of time. I loved hanging out with this beautiful girl and her sweet family. I love this color and I just love this little one! How adorable is this smile?! She is just too perfect for words! The most perfect hair I ever have seen. And oh those feet! There's nothing better than a brand new baby :) Fresh baby sessions rank right up at the top as my very favorites! They're a great alternative to birth sessions and capture your sweet baby while they're still brand new. This sweet girl is so loved and makes a perfect addition to her amazing family. Have you ever seen anything cuter?! This little one loved sticking her pinkie out the whole time I was there to visit. Baby Feet. I just cannot get enough of these perfect little piggies! I cannot believe that this sweet girl is ONE already! I've been shooting this cutie since she was 6 months old and time just flies by. I always love having her come to my studio, she's so much fun and this cake smash was no exception! :) Her momma told me that this was her first time having sugar and well.... I think she loved it :) She even came back for round two after getting cleaned up! I hope you all enjoy these sweet photos of this little one!